“Ghost Town” was a non-LP single by The Specials that made a really big impact in 1981. The song was inspired by the recessional malaise afflicting Britain as the 70s became the 80s as well as events like the beating that Lynval Golding had received the previous year from racist scum. The latter event was directly addressed in the B-side, “Why?” but it probably colored Jerry Dammer’s succinct but dark snapshot of British society ca. 1981. That the single arrived as the country had erupted in a wave of race riots was down to it having it’s finger right on the pulse of the zeitgeist. The song was more of a venture into reggae than the upbeat ska sound that the band was known for. The track opened with the sound of desolation [was that a siren in the distance through the howling winds?] as Dammers’ rising organ crescendo served as an establishing shot of Britain at an impasse. The serpentine flute weaving through the skank was a last-minute addition to the song, but thankfully, Dammers had the idea to add it, even though all eight tracks on the master were gone by that time. It pulls the listener into the foreboding environment brilliantly. Then the malevolent swagger of the horn section hit with great impact. It sounded like a minor key Bond theme with John Barry going bluebeat. Interestingly, the lead vocals here were from Neville Staples with nominal lead vocalist Terry Hall only offering a line in the verses with him taking full lead strictly on the middle eight over the sound of conspicuous jollity from the past that was absolutely missing everywhere else in the song. Jerry Dammers sought out a different producer who normally worked in reggae for this song, which he had been planning for long months before the rapidly disintegrating band managed to record it in producer John Collins’ small 8-track studio. Collins normally cut reggae sides and he recorded this song in much the same way. Eight tracks in mono run through a stereo reverb for effect. When Dammers got the inspiration for the flute, it had to be overdubbed on a track with the brass already recorded. And the brass section had already left by that point. Needless, to say, it was white-knuckle time in the recording booth as this went down. One slip up and the brass track would have been ruined. I’d like to think that this further tension added to the vibe of the song. What with the band flying apart and the sentiments of the song reflecting their environment so acutely, I cannot imagine it not being the impactful song that it clearly was. The Specials would splinter as the song was lodged in the number one spot on the British charts with Hall, Staples, and Golding leaving to form The Fun Boy Three, but not before this classic was released by the band. If you’ve never heard it… then by all means hit play! I remember wanting the US 12″ of this song since it came out but I can’t say I’ve ever seen it in the bins. Not even the UK version. 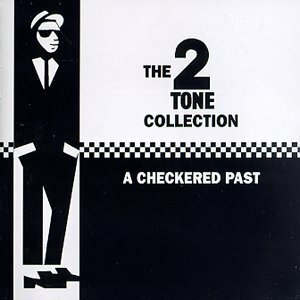 My copy of this song comes from the immaculate compilation of 2Tone singles “The 2Tone Collection – A Checkered Past” as compiled by Vinny Vero during his “tearing it up” years at EMI when he first came to my attention. This 2xCD contained every 2Tone A-side released by the Chrysalis imprint. It more than works for me thought I would not say “no” if I ran across the extended 12″ of this one! 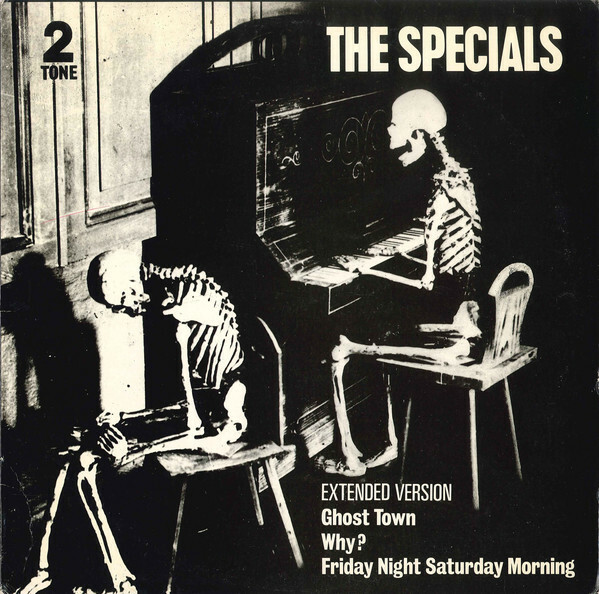 This entry was posted in Ska, SOTD and tagged 1981, Ghost Town, The Specials. Bookmark the permalink. I recall watching CBS evening news as a kid and one night they had a bit about riots in England. They started off with a mention that the #1 “pop single” was Ghost Town and they played 15 seconds of it. I spent the next year in my central VA town looking for the single (never found it) and finally got a copy when I went to the UK the following year. Such a great elfin record. dhrichards – That’s amazing but I can maybe top that! I first heard about the New Romantic movement when the tail end of the CBS Evening News in 1979 showed a feature on the “next thing after Punk Rock… The Blitz!” A year later I was all over that sound, but at the time it was just a weird thing on the news with people dressed in very outré outfits. Jeremy Shatan – Welcome to the comments! So you’re the one who got that copy?! It was certainly not plentiful. That’s for sure. Great, cheap but effective video as well. Can you imagine what it was like to have this song at number one? Extraordinary really. It was the first 18 months or so of the Thatcher reign, really those were bleak times. This song never fails to stun me when I hear it. Such an amazing combination of music, lyrics and utter relevance to the political and social situation. Of course we are in a bleak/farcica political/social state now….I have no idea what the number one in the charts is and would be depressed to know probably. SimonH – That video was directed by the great Barney Bubbles (R.I.P.) and really added to the nightmarish quality of the song. At the time, I had sat out the first two albums by The Specials. The ska band for me were The Beat. They still are, but now I have time for The Specials. But this song was a mighty convincer at the time for me. Of course the band fractured immediately afterward! hope you had a chance to hear the 12” version because it has a killer trombone solo/dub section and is an excellent longer version which doesn’t feel like it has been stretched for dancefloor purposes. Don’t know who would want to dance to 6 minutes of brilliant bleakness though…. Whatever happened to Vinny Vero, his blog is dead for years now…..Compilating and remixing Bright Light Bright Light are the only things i can find …. All the best from the Low Lands! Fred – Welcome to the comments! No, the 12″ version is still m.i.a. for me. One day I’ll excitedly run across it. I also miss Vero’s blog. I used to be a heavy commenter since he and I have fairly congruent tastes. Come Back To The Five And Dime, Vinny Vero! Bought the 12″ at Vintage Vinyl in Evanston, Illinois. It was a snowy Saturday just before closing. Some things you never forget. I was incredibly late to the Specials party, I didn’t listen to or hear any of their stuff until I fell hard for Terry Hall circa his work with Ian Boudrie and started exploring his catalog. I hate thread highjacking, your site really needs a forum (*HINT* *HINT*) but this week has just been a real drag (and by drag I really mean *^($^%^)@! but I don’t want to swear in your comments). I have a Madness collection cd in my car and dammitall listening to that each day on my way home from work has been skatastic sonic prozac. Tim – That’s a provocative suggestion! But to enable a forum I’d need to upgrade from a “personal” account to a “business” account – which costs twice as much [*HINT* *HINT*]. Just saying. I was all over the ska scene from the word go, but this single more than almost any other marked the movement as deeper and more interesting than just good-time ska-robics (but boy did I sweat off the pounds at those concerts!). As someone who has kept up closely with UK politics for a very long time, the song’s political impact was like a 30-megaton bomb that perfectly articulated what was going on at the time. Looking back it is kind of bewildering how fast we went from Ska to New Romantic as the leading movement of the day, but I’ll be forever grateful to the 2Tone movement for addressing racism head-on and making a young kid much more aware than he thought he already was (thanks to Bowie as much as certain black artists themselves) on the enormous contribution of “black music” to … well, everything. I have little doubt you’ll come across this… I’ve seen it several times in the used bins (and found it there myself long ago). “Friday night Saturday morning” is a good song also. I adored all of 2-tone’s ‘big four’ (specials, beat, selector and madness) and this release was one of the best, although the four debut albums are like Mt Rushmore. Bpdp3 – I have to admit; I was very resistant to the charm of 2nd wave ska. I recall chasinvictoria buying “ The Specials” early on and I just didn’t hear it. Likewise with Madness. It sounded too much like the 60s to me. What finally tipped my hand was hearing The Beat’s stellar cover of “Tears Of A Clown” that finally cracked my shell. That was one of the first songs I heard when I started listening to the radio on my own, and was not only bulletproof, but had been severely augmented by The Beat’s arrangement. Fantastic post, PPM! Dammers revisited “Ghost Town” a few years ago with his Spatial AKA Orchestra–here’s what I wrote about it: https://duffguidetoska.blogspot.com/2014/09/duff-review-spatial-aka-orchestra-ghost.html. Steve Shafer – I didn’t know about that one. Sadly, I can’t imagine that song ever losing its social relevance. The new album (“Encore”) is quite good. I just read back to back interviews with them, one on Rolling Stone and one on the Guardian and bought it on the strength of those and am not disappointed. Tim – I just popped over to iTunes to sample something, and I saw “Encore” on the home page! I didn’t even know!